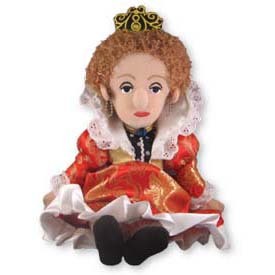 'Good Queen Bess' was trained in History and Philosophy, Greek, Latin, French and Italian. She played the Polyphant and the Virginals, and danced well into her old age. By refusing to 'make windows into men's souls' or to dispute 'over trifles,' she reached a religious settlement between Catholics and Protestants, saving England from civil war. Now you can bring Her Majesty the Queen home to your palace and live like royalty. Measures 12" tall when standing.